At eight years old I had a gangly body, long braided hair, and glasses that stayed hidden in their case unless I really needed to see the board. I was walking fodder for the mean-spirited elementary school jokesters. I loved the Wishbone show. 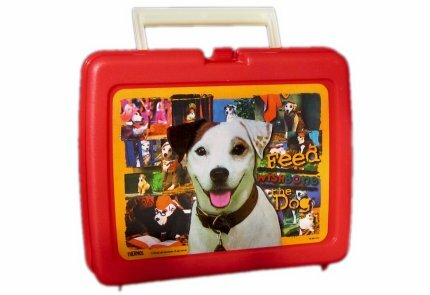 I loved my lunchbox with that plucky dog pasted on the front. However, I really didn’t want to be teased because of my Wishbone lunchbox. I was teased often enough for the unchangeables—height, hair, and optical assistance. One day after surreptitiously placing my glasses back into their case (which was then tossed unceremoniously into the deep, dark recesses of my backpack), I walked with the rest of my class to lunch. My bright red lunchbox swung with my bouncy steps, much like my hair. The sun was shining. Life was perfect and nothing could ever go wrong. A boy caught up to me in our pilgrimage to the cafeteria. I knew him, but not well. As far as I could tell, he ran with the “in” crowd, which I truly wanted to be a part of. He eyed my lunchbox and then looked up at me, obviously about to ask a question. And yes, he did have to look up. I was much taller than most of the boys in my grade until puberty could give them an edge. “You watch Wishbone?” he asked. My brain was busy panicking and couldn’t process anything except the probability of being teased for my answer. I was finally able to push out a meager excuse, one that I hoped could deflect the laughter that would most certainly follow. Whew! That had to work. Maybe he would even think I was cool enough to join his crowd. But his face actually fell a bit. He walked away after saying this. Conversation closed, because I had ended it before it began. I was left to my thoughts. I was also left to the guidance of the Spirit, a recently received gift. And I was asked a second question. Janae, what if he had asked you if you believed in Jesus Christ? I felt almost like I had walked into a wall. If I wasn’t brave enough to tell the truth about a favorite TV show, how could I defend my beliefs? I wanted to have my heart in the right place. I wanted my faith to be powerful and strong. It’s been twenty years since I was asked those questions and I think of them often. Those questions have shaped many of my decisions and helped me to strengthen my weaknesses. Missionary work comes most often to my mind when I think on this experience. It’s natural to see the question, “Do you believe in Jesus Christ?” coming from another person; however, recent experiences have helped me see that life also asks me this question. Trials come, stop me in my path, and ask me if I still believe in Jesus Christ. Do I believe in Jesus Christ, in the reality of the resurrection? Do I believe that His Atonement is able to make my sins as white as snow? Do I believe the words He taught and the commandments He gave in the scriptures? I’d like you to know that I do believe in Jesus Christ. He is the Son of God, our Savior and Redeemer. We will all be resurrected, someday, and so will our loved ones who have gone on before us. I hope that I can always be brave and faithful enough to say that. I hope that no matter what happens in life I will be brave enough to act on that faith. And Ben, I do really love the Wishbone show.